Cutting concrete is often necessary in remodeling basements or slab on grade buildings. It is needed to install new plumbing, to identify leaks in existing plumbing, and to place a new drain tile system. 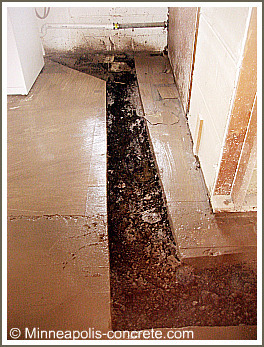 In this basement floor (pictured above), concrete was cut to extend the existing plumbing to a new bathroom. Once the plumbing is installed and inspected, new concrete is poured and finished over the top of the pipes to match the rest of the existing floor. Use a sledgehammer and beat it out. This is fine on very small jobs, but it is not as clean a job and you can cause more cracking in your existing floor. Therefore, it is not recommended unless you have a strong back. You can rent a jackhammer to power the concrete out. This will be very loud, so wear goggles and ear plugs.The jackhammer also gives the same results as the sledgehammer - you can crack existing floor that you weren't planning on removing. The only advantage over the sledgehammer is that it is not as physical a job. Click Demolition Hammers to purchase this tool. Saw cutting with an electric or hydraulic concrete cutting saw. It takes more skill to run these, so often it is best to hire a concrete cutting contractor. If you live in the Minneapolis and surrounding suburbs area, request a bid on your concrete cutting project here. Concrete drilling is done to install rebar into existing structures, to install fasteners such as anchor bolts in foundations, and to hang shelves or pictures in any walls made of brick, stone or concrete. You will need a hammer drill and a hammer drill bit to do the job. Remember to wear safety gear such as goggles ear plugs and a dusk mask if you decide to do this yourself. 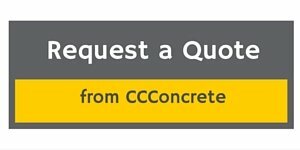 If you live in the Minneapolis and surrounding suburbs area, request a quote on your concrete cutting or drilling project here.